Feed costs represent 40 to 60% of the total cost of producing milk on dairy farms in the US. Prices paid for purchased commodities or forages greatly impact feed cost and farm profitability. Dairy farmers have little control over these prices, especially when purchased on the immediate market. Current prices for commodities reflect changes in supply and demand due to US and global weather patterns, international purchases, and usage of commodities by ethanol production, all of which are outside a farmer's control. However, efficient usage of these commodities and forages on-farm and minimizing feed wastage or shrink are under a farmer's control and greatly impact a farm's profitability. In this two-part series, we will examine areas within a feeding program where farmers can reduce feed shrink and better utilize money spent for feed ingredients. Many of these areas and concepts regarding feeding and feed management for the dairy herd may seem simple, but in my experience, they are often the practices that separate profitable dairy herds from the less profitable ones. Minimizing feed waste or shrink is one aspect of a feeding program which must be managed since it impacts feed usage and costs as well as overall profitability of a dairy operation. the amount of feed used on farm, actual usage and disappearance needs to bemeasured. The amount of each commodity needs to be weighed at either delivery or harvest and at feed out. 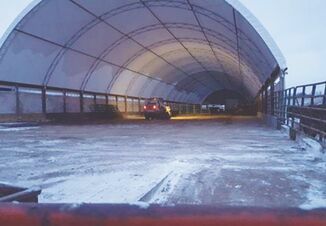 Mismanaged practices during storage of silages (see article #2 of this series). Today, the routine use of scales for delivery trucks and feed tracking software, for example Feed Watch‚Ñ¢ or TMR Tracker‚Ñ¢, make these calculations routine and easier for managers to detect problems or opportunities.Once detecting that losses are greater than established benchmarks or have increased over time, feeding practices can be evaluated and then modified to decrease feed shrink. Generally, dry commodities stored in bins have less storage losses (usually less than 4%) compared to those stored in open-face, 3-sided commodity sheds (5 to 15% depending on commodity). Certain commodities, like whole fuzzy cottonseed, will not flow through feed bins and thus, must be stored in a commodity shed.Weather, i.e. wind, can increase feed shrink not only at delivery and storage, but as importantly when commodities are loaded into the TMR mixer.These wind-related losses can occur when commodities are stored in open-sided commodity sheds as well as feed bins and liquid delivery systems.Properly constructed windbreaks can help minimize losses.For example, "L" shaped commodity sheds which are positioned perpendicular to the prevailing winds can help reduce feed shrink.Totally enclosed commodity sheds or an enclosed area when adding commodities stored in a bin or liquid delivery system to the TMR mixer can reduce feed shrink related to weather and may be cost effective when considering reductions in feed shrink. Storage losses with wet commodities, such as wet brewers or distillers grains, are higher (generally 20 to 25%) than when stored as a dry ingredient and, as such, these higher losses must be considered when calculating the economics of using these feeds.Fermented forages properly stored in bags, uprights, bunkers, or trenches generally have storage losses of 5 to 10%.Improperly stored forages, especially those stored in bunkers and trenches, can have storage losses from 10 to 15% or higher.Alfalfa hay stored inside generally average 3 to 5% feed shrink as a result of storage losses. 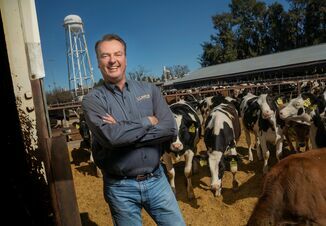 Dairy feeding programs that wisely use feed, labor, and economic resources start and end with good communication between dairy managers, nutritional consultants, and feeding employees. relationship that results in a true dialog. Improvements in your bottom line can occur through discussions related to different ways to group, feed, and/or manage your herd. These discussions also can help when contracting for commodities, both related to tonnage needed and alternative commodities which can save feed dollars or improve milk production. Sometimes, producers incorrectly believe that they do not need to oversee and/or understand general feeding and nutritional concepts. Understanding these concepts is critical for this dialog and to understand when and how to make minor adjustments or temporary changes before they become disasters. Besides maintaining good communication between the owner/manager and consultants, communication to and from the personnel actually feeding the cows and heifers is critical. Oftentimes, the person feeding the cows can provide invaluable insight as to why things are not working as expected or suggest improved ways to feed, reduce feed shrink, and manage the feeding program. On-going training, not just new employee training, should be provided. Feeders need to understand the why's and why not's of feeding procedures, along with how to perform their job responsibilities. This education helps explain why certain steps are critical, why ingredients need to be added in certain order and amounts, and practices that should be avoided. After forages are harvested for a given crop year, a plan for using these forages should be developed and modified as needed throughout the year. This allows one to efficiently use available labor, feed, facilities, and economic resources. By taking preliminary forage samples and developing preliminary diets for a herd, forages can be allocated to various groups of dairy cows or heifers based on their nutritional needs. Additional forages, if needed, can be purchased or plans made as to what and how much is needed. Also, commodity needs can be assessed as to the amount needed, and commodities can be purchased or booked at the appropriate time to minimize feed costs and economic risk. When developing this feed usage plan, labor resources and facilities need to be considered. All of us understand that the more uniform in production, stage of lactation (i.e. fresh cows, late lactation cows with body condition score ‚â• 3.0), and number of lactations a group of cows are, the closer we can match their nutritional needs. These rations would ideally result in a higher income over feed cost versus those from a group of cows whose performance is less homogenous. Economic models developed by Dr. Victor Cabrera at the University of Wisconsin (2016 Tri-State Dairy Nutrition Conference) indicate at least 2 nutritional groups of lactating cows plus a fresh cow group may result in higher total income over feed cost. This model used data from 5 herds with 331 to 1460 total dairy cows and compared the income over feed costs associated with 1, 2 or 3 nutritional groups after they were 21 days in milk. The largest gain in income over feed cost was seen when the number of nutritional groups of cows was increased from 1 to 2 ($39 increase/cow/year difference between 1 and 2 nutritional groups). When the number of nutritional groups was increased from 2 to 3, only a $7 increase/cow/year was estimated based on scenario assumptions. Feed costs and milk prices also greatly impacted economic returns associated with the numbers of nutritional groups of cows. When deciding the number of nutritional groups, total impact on income, not just income over feed cost should be considered. Thus, herd size and feeding labor, equipment, and facilities needs to be considered. Depending on the size of the dairy herd and economics, one or multiple total mixed rations (TMR) can be mixed and fed to the lactating herd. The definition of a TMR is a mixture of all the forages (dry hay and silages), concentrates, and mineral, vitamin, and additive premixes blended together and offered to a group of cows as one feed mixture. sorting by dairy cows and improves the consistency of nutrients provided to the rumen microbes, assuming cows consume somewhat uniform sized meals throughout the day. TMR mix time after the last ingredient is added should be 3 to 5 minutes for vertical and horizontal reel-auger mixers with tractors or trucks at nearly full power (1700 to 2000 rpm engine speed). Under mixing results in an inconsistent mix delivered to the feedbunk. Oftentimes, corn silage is the last ingredient loaded and with inadequate mix time, only corn silage is unloaded last from the mixer. Over mixing can result in decreased particle size for long-stem forages and results in cows with ruminal acidosis and resulting in sub-optimum feed intakes and milk production. To check if mix time is adequate, 10 samples from equally spaced locations along the length of the feedbunk should be collected and processed through a Penn State Particle Separate box. Samples from the middle and bottom screens of a 3-screen system should have an average coefficient of variation (CV) of 2% or less (Oelberg and Stone, 2014. Vet Clin Food Animal, page 721). Do not overfill mixers since this will result in spilt feed, increased feed shrink, and incomplete mixing of the ration for a group of cows. For vertical mixers, feed should not be more than 2 feet (60 cm) above the augers (Oelberg and Stone, 2014). Mixers are sized by volume not weight, with drier forages requiring more volume for their given weight. Watch that batch sizes are such that the feeds reach the top of the augers within vertical mixers. When the feeds do not reach the top of the augers, proper mixing does not occur and this can result in cow-health issues. Undersized batches can occur when mixing rations for smaller groups of cows, such as the fresh cows or close-up dry cows. Dry forages need to be chopped, such that alfalfa hay is 3 to 4 inches (7 to 10 cm) long (width of a cow's muzzle) and straw is 2 inches (5 cm) in length in the TMR delivered into the feedbunk. Under processed hay or straw can result in clumps of hay in the TMR mix and sorting of the TMR by cows. In this case, the following should be checked. Insure liquid ingredients are added last and distribute using a wand over the face of the TMR while mixing. Check that ingredients are being added in the correct amount, order, and location within the TMR mixer. For vertical mixers, feeds should be loaded in the center of the box, not down the sides of the mixer. Layout of the feed facilities should allow labor responsible for feeding the cows to easily and efficiently load, mix, and deliver a batch of feed to any group of cows or heifers in the facility and feed all groups of cattle within a reasonable time frame. To accomplish this objective, feeding facilities should be designed with forage storage located in close proximity to commodities. Commodity blends can be mixed on-farm or purchased to reduce the number of ingredients added to each batch of feed, reduce weighing errors, and improve labor efficiency. 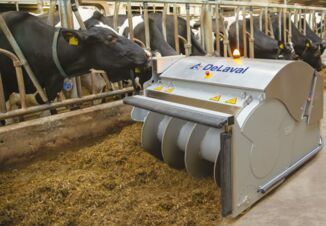 The number of different rations mixed and fed on a farm should be a function of availability of labor to efficiently mix multiple diets, size of TMR mixer(s), cost savings, and available cattle housing and feed-mixing facilities. TMR mixers should be serviced on a routine schedule and augers, knives, and kicker plates replaced when needed. Handling equipment should be sized appropriately for the dairy operation and routine maintenance performed to limit breakdowns. Human safety always should be a top priority, and feeding facilities need to be reviewed at least yearly to correct any potential safety issues, such as uncovered PTO's and ease and safety of adding ingredients to a mixer. The mixing quality of the TMR should be evaluated occasionally. Does the mix look the same over the length of the feed bunk? Has the forage particle size decreased too much by the TMR mixer? The use of the Penn State Particle Size box can be a useful on-farm tool to evaluate mixes and performance of personnel mixing feed. Dairy cows should be consuming a similar amount of feed as suggested in balanced rations. If not, discuss this observation with your nutritionist, who may wish to make adjustments in the diet. Daily or weekly refusals need to be weighed to assess the consumption by each group of cows. In the next part of this series, we will examine ways that dairy operations can better manage their available feed and labor resources to improve a farm's profitability.